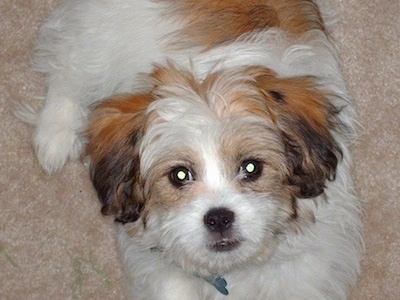 "Mia is a Maltese / Lhasa Apso mix; her dad was a Maltese, and her mom was a Lhasa. She is about 5 years old in this picture (though she still looks like a puppy!) with a weight of almost 10 pounds. We have only had her for about 2 ½ years but cannot imagine being without her. As we've learned more about the specific traits of her two breeds, we have discovered that her personality reflects them both pretty equally. 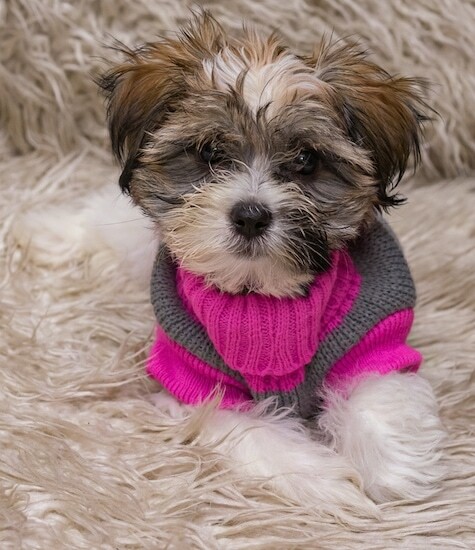 Some of her Lhasa traits include devotion to her human family, affection toward people she knows (and leeriness of strangers), alertness as a watchdog and protectiveness of places she considers "home," and some apprehension of small children and other dogs. 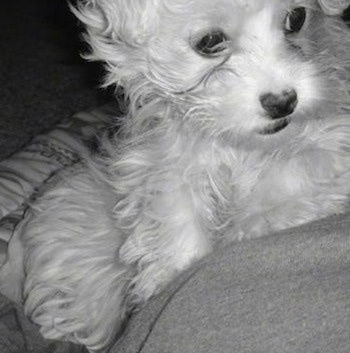 Her gentle nature, well-mannered behavior and propensity for cuddling are examples of her more Maltese-like characteristics. Mia is an extremely loving and sweet dog, but she lacks the playful attitude of many dogs of a similar breed (although she is known to have extreme outbursts of energy, where she will run around the yard for several minutes at a time!). She enjoys nice walks around the neighborhood, but is perfectly content to stay at home. 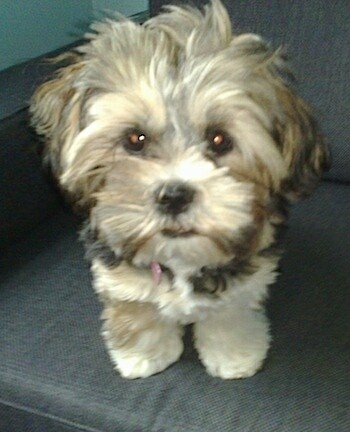 Overall, she is an absolutely wonderful dog and companion, and we feel so lucky to have her!" The Lhatese is not a purebred dog. 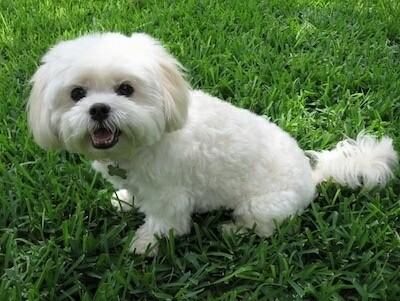 It is a cross between the Lhasa Apso and the Maltese. The best way to determine the temperament of a mixed breed is to look up all breeds in the cross and know you can get any combination of any of the characteristics found in either breed. Not all of these designer hybrid dogs being bred are 50% purebred to 50% purebred. It is very common for breeders to breed multi-generation crosses. This hybrid is considered different than the Kyi-Leo® breed and cannot be registered with the Kyi-Leo® Club. 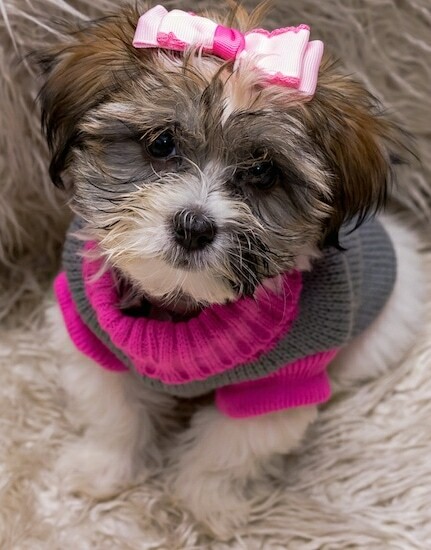 Sophie the female Lhatese (Lhasa Apso / Maltese mix breed) as a puppy at 12 weeks old—"Meet little Sophie, born 28 February 2016. Sophie loves to play with all the family and we think that Sophie believes she is a cat as she loves to play with her front paws all the time just like a kitten. Sophie is extremely well behaved, was very easy to toilet train using the Pee Wee Pet beds as she is indoors all the time. What a loving family pet the Lhatese is and Sophie has proven this to be true so far." 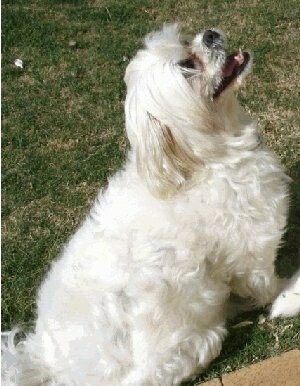 Squish the female Lhatese (Lhasa Apso / Maltese mix breed dog) at 7 years old—"Brings great delight to her Perth, Western Australian owners. 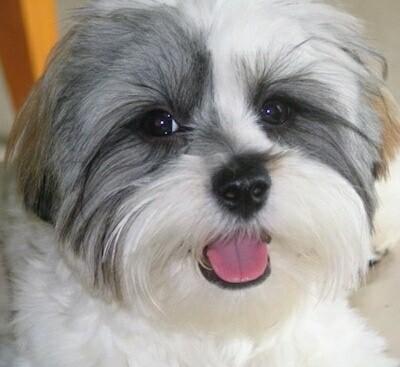 A beautiful breed that has a happy disposition (most of the time). Loves to guard food, can be obsessive but also intelligent." 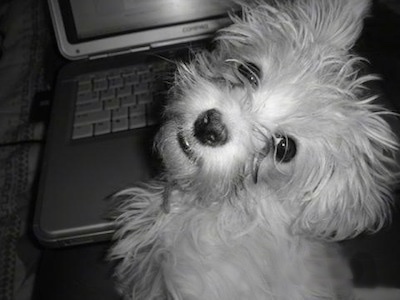 Squish the female Lhatese (Lhasa Apso / Maltese hybrid) at 7 years old—"Squish, showing her obsessive nature by staring at a mouse on the wall for over an hour with a big grin on her face." 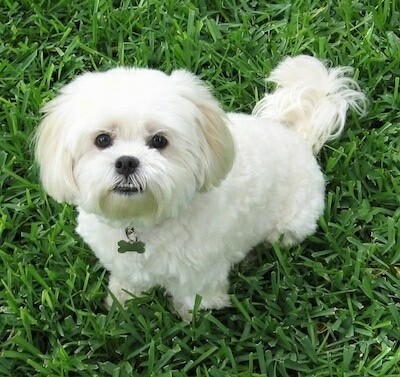 Jake the Lhatese (Maltese / Lhasa Apso mix) at 1 year old—"He has the sweetest disposition; is quite the lap dog—has to be near you all the time. We can't imagine life without Jake!" 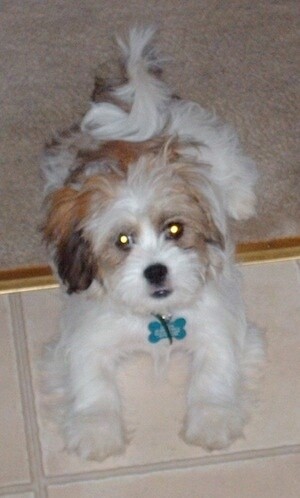 "This is my little Camden St. Clair, a Lhatese as a 4 month old puppy. She weighed 3.8 lbs. 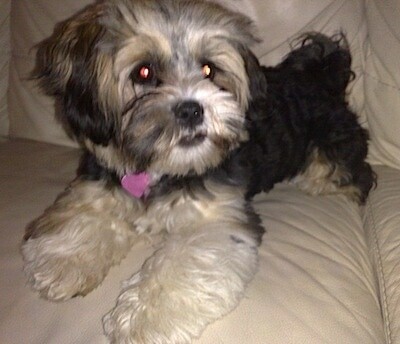 She is 3/4 Lhatese and 1/4 Lhasa Apso. She is my little baby and a perfect lap dog. Definitely S-P-O-I-L-E-D. Wherever you see CC, you see little Cami. 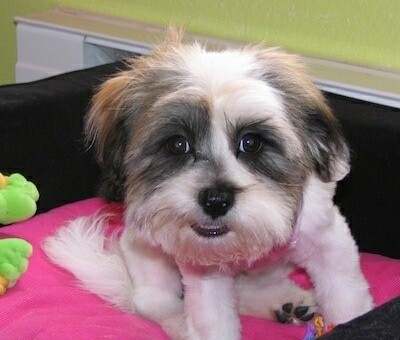 :)"
Thi sis Mia the Maltese / Lhasa Apso mix at about 5 years old. 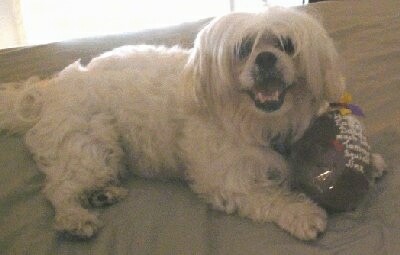 Her dad was a Maltese, and her mom was a Lhasa. "This is our Lhatese, Elle Belle. 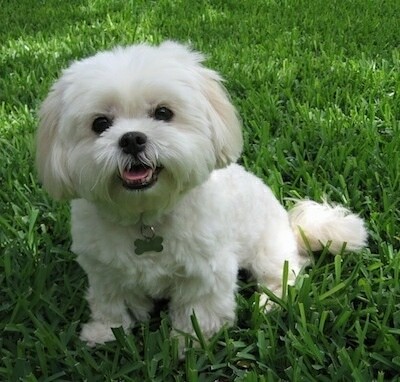 Her father is Maltese and her mother is Llasa Apso. She favors her father in her size and coat, but has the color and disposition of her mother. She is 13 weeks old and weights 2 lbs. 9 oz. in this picture." 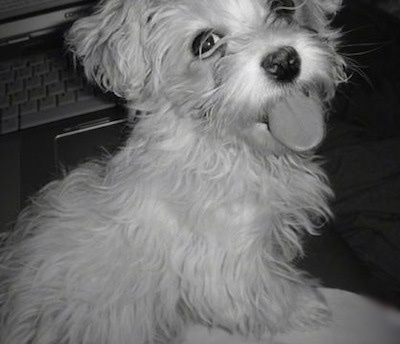 Goliath the Lhatese as a puppy at 5 months old—"This is my baby boy Goliath. Goliath is my lil' cat dog, he loves to climb on the couch and sit on the back. 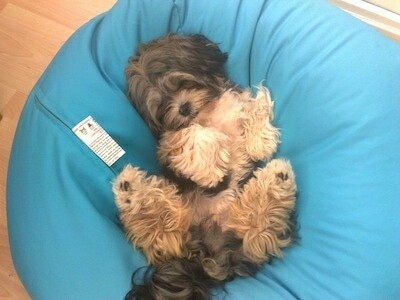 As an adult he is very stubborn, but he loves to be with the family as long as possible and we love him with us too." 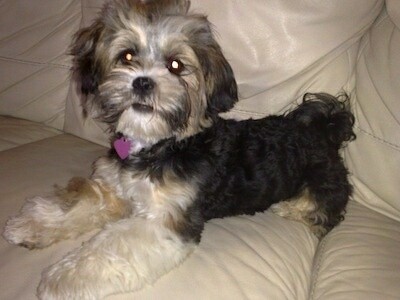 "This is Lilly my Lhatese at 7 months old. 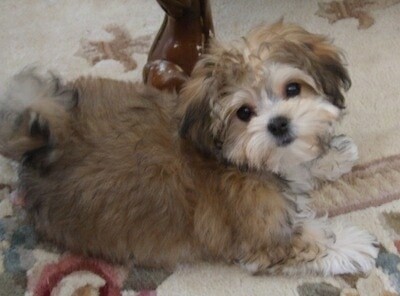 Her mom is Maltese and her dad a Lhasa Apso. We adopted her when she was 8 weeks old. She is so good with my two children and a pleasure to have. I get stopped by people all the time asking what breed she is as she is so cute."